We got a call from our 16-year-old nephew, J, last week. It was his spring break and he had an offer to spend the weekend at the beach with his buddy and his buddy’s parents. But, he would have to pay for his share of a hotel room. And he needed spending cash. He needed money and he needed it fast. No, he wasn’t calling for a loan or a handout from his favorite aunt and uncle. He was looking for work. For the next day and a half, he pressure washed, cleaned out gutters, moved landscape rocks, dusted plant shelves, and performed various other tasks around our house. He worked! I mean he really, really worked. It was impressive. His phone sat in our kitchen charging all day. Friends texted all day long, but the texts would have to wait. He was working. At the end of the first day, I gave him a ride – to another job! When he finished the second day, I paid him cash, he left happy and ready for his fun weekend, and we were thrilled with all the finished chores we no longer had to find time to do. I didn’t ask J, but I have no doubt he experienced that good kind of tired Rachel talks about in Smart Money Smart Kids. I’m sure his time at the beach was all the more sweeter knowing he earned it. Little Man, our four year old, loves his cousin J. He saw J working hard outside and asked me why (four year olds just love to ask why). I explained J was working to earn dollars to pay for a hotel room; it was similar to when he earned quarters for picking up his toys. He promptly declared that J should buy him a new Percy train with the dollars. Ugh, oh well, I’m just glad we’ve got a few more years to keep working on this whole “training him up” thing. And I’m so glad there is an entire chapter devoted to the subject of work in Smart Money Smart Kids. It explains how working gives a kid dignity and combats the attitude of entitlement. The book gives detailed, practical advice for how to implement a commission system for any age child (age 3 to college) to teach him that money comes from work. It involves paying the child to do a small number of chores. It explains the difference between a commission and an allowance and why the difference matters. There’s a common concern that comes up whenever the commission system is discussed. The book does a great job of dispelling this concern, but I wanted to address it briefly here since it comes up so often. Many parents feel kids shouldn’t be paid for household chores; kids should just do them because they are part of the family and everyone should pitch in and help out. I agree! But, here’s the thing. You don’t have to choose one or the other. We’re talking about choosing just three to five chores to pay commission on, not everything little thing they do. So they can learn the work-money relationship AND the responsibility of being a part of a family. 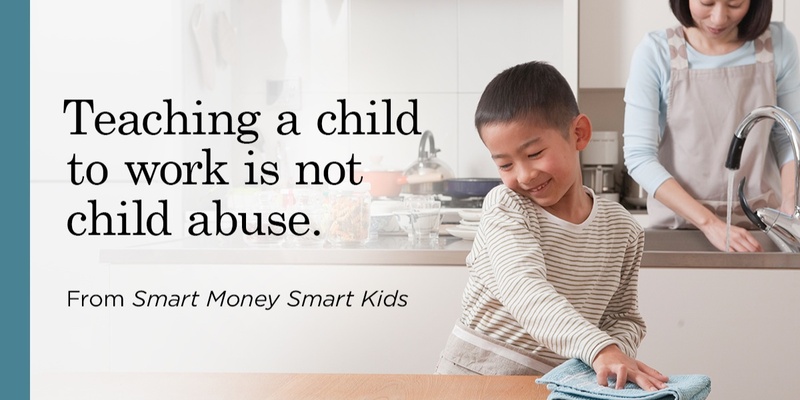 If you click on the Smart Money Smart Kids ad on the upper right side of this blog site, you can download the first two chapters of the book for free and see how awesome the Work chapter is for yourself! And just clicking on the add helps me out. I’m in a contest with other bloggers to get the most clicks. So click away please! If you missed my book review of Smart Money Smart Kids, check it out here. Did you work and get paid when you’re growing up, either doing chores for your parents or working for others? What types of chores/jobs did you do? If you read the first two chapters of the book, I’d love to hear your thoughts!